Problem – increased fuel consumption – is quite common. In this entry I will try to gather all possible reasons, special accent putting on possible defects of petrol engines. fuel consumption increased after all kind of “updates”. In the second scenario – no standard solution available. Upgrades (chosen by “authors”) could be all kind – the exhaust is rebuilt, intake manifolds are changed, camshafts from different engines are installed. Not even talking of all kind of turbo projects, custom DME installation, etc. In this entry I will describe the first scenario – the car has normal fuel consumption, but it has increased (without any interference in the construction). In the beginning – shortly about most typical problems, which are not related to the defects of the engine. Problems with running gear of the car: pledging of brakes of any wheel or incorrect geometrics of wheels. Pledging wheel can be detected, checking the temperature (by hand) of the wheel hub after driving (avoiding braking, if possible). Incorrect geometrics of wheels – it has to be paid attention to, if the car has hit some larger hole, hit the border, the driving wheel don’t stand straight anymore. Problems with torque converter of the automatic transmission. If torque converter doesn’t switch on, the fuel consumption, driving evenly (the transmission in gear 3+), will increase by 20 .. 25%. Typical syndrome of the defect: RPM of the engine changes floatingly, when driving evenly (cruise control on). Of course, if the gearbox work in emergency mode, fuel consumption will be significantly increased. It is clear – if the gearbox doesn’t switch “as usual”- the problem with its performance has to be solved. In further entry – regarding problems, associated with the engine. Hidden or partly hidden defects. The first problem (very common), regarding which the DME usually don’t record any error messages – problems with (by low temperature) thermostat. If the thermostat has clogged in open position, the engine will work with decreased temperature. The fuel consumption grows because the oil is thicker, also other positions of VANOS are used, the settings of other systems (optimal especially in the heating stage of the engine) are used, also because the N series engines don’t decrease flowrate/pressure of water pump and oil pump (they consume additional energy). CO catalytic converters are additionally heated in the process of heating up the engine – they receive an enriched mixture (exhaust VANOS is with strongly late phase, Lambda typically around 0.98). Second common problem – DME has identified the decreased efficiency of CO catalytic converters. This problem hides very well. At first – diagnostics “specialists” usually simply delete these error messages regarding CO catalytic converters. Yes, the error messages “disappear” from the error message list (before they get confirmed again – it takes a while: several hundreds of km or even more if driving short distances). But actually, the status of these error messages all the time stays active. CO catalytic converters are getting additionally heated all the time (to increase their performance), exhaust VANOS – held in position, when part of the unburned fuel is “sent” to exhaust. Third common problem – misfires. Misfire of some cylinder, which doesn’t happen very often, don’t increase the fuel consumption significantly by themselves, but they could be a cause, why DME thinks (detects by data of control Lambda probes), that the performance of CO catalytic converters is (as if) decreased. If instead the insufficient performance of CO catalytic converters is previously detected (even without a reason) – due to causes, mentioned above, the fuel consumption increases. If other self-diagnostic messages, recorded by DME (for example, error messages regarding defects of Lambda probes) usually earn some “respect” from diagnostics “specialists” and are solved, if the increased fuel consumption is detected, then Valvetronic – the impact of this hub to the increase of fuel consumption is underrated. The first block of problem situations – DME has identified a fundamental error in the Valvetronic module and switched it off (of course, there will be error messages regarding Valvetronic). If the engine, equipped with Valvetronic, don’t use it, fuel consumption will increase for around 15 .. 20% (higher increase – in idle or on low load mode). The second block of problem situations, which are partly connected with Valvetronic: totally incorrect performance of the engine in small intake valve opening mode (idle, small torque mode). If the engine, which uses Valvetronic, has problems with oiling of HVA (typical cause of the problem), in the small intake valve opening mode the filling of cylinders with air is significantly different. The difference can reach even 50% or more. Accordingly – one or several cylinders will work with the very rich mixture, others – with very lean. The efficiency of the engine in idle can be decreased by 1.4 .. 2 (!!!) times, accordingly – it’s fuel consumption – increased rapidly. A problem (smaller, but with sufficiently significant impact) persists also in small load modes when driving. Typical symptom – in idle, the engine vibrates continuously – feels like a diesel engine. Rough run data show a high difference between the mechanical efficiency of cylinders. 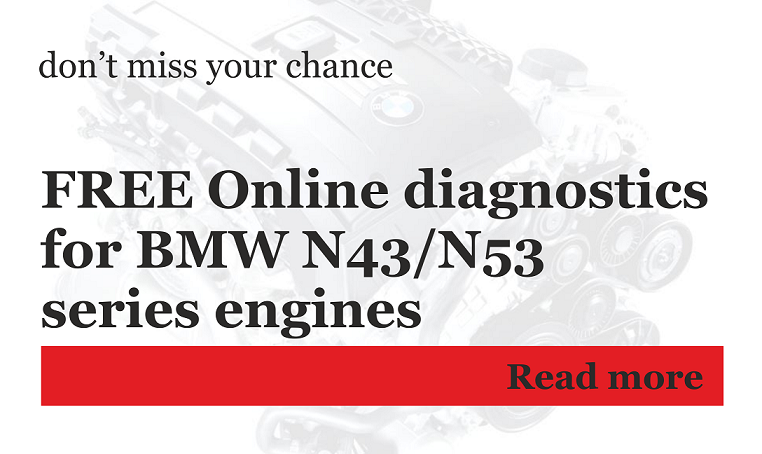 If the error message memory of N43/N53 series engines contains error messages regarding NOx sensor and/or NOx catalytic converter (30EA; 30E9) or – the NOx sensors have hidden defects, due to which the engine doesn’t use Stratified charge, average fuel consumption (depending on driving mode) will be increased to 15 .. 25% (higher increase – in low load modes). Yes, sometimes a self-diagnostics system of DME don’t recognize damaged Lambda probes, as a result – the fuel mixture is far away from optimal, fuel consumption increased. Different DME has different test blocks of Lambda probes. Unfortunately, they are relatively complicated, more simple/older DME doesn’t have them at all. So I offer a quick and efficient method, how to make sure if Lambda probes are able to work at least somehow. Turn on the engine, warm it up to the working temperature. Connect INPA, open menu, where the voltages of Lambda probes can be seen. a voltage of the narrowband probes (before CO catalytic converters) has to be >1.00V. If the indications of probes are correct in modes, mentioned before, they will not be the cause of significantly increased fuel consumption. Yes, such quick test doesn’t give a guarantee for the totally correct performance of the probes (the wideband probes can have incorrect adaptations, incorrect individual adaptations of cylinders – these problems have to check more detailed) – CO/HC in the exhaust can be increased. But, if the probes are reacting to a rich/lean mixture (additionally, driving evenly – confirms approximately Stoichiometric or Stoichiometric/Stratified mixture: for N43/53 series engines), they will not be guilty in the situation, when the fuel consumption is increased significantly (+20% and more). Any of cylinders has switched off. For technical people, such situation sounds as an emergency, but for a daily user – nothing special, happens. Yes, if one cylinder of four for the 4-cylinder engine will switch off, the performance will be difficult, but with 6-cylinder (don’t even talking about 8+ cylinder engines) engine it will be possible to drive. A specialist should not have any problems to identify this situation, but, for example, if in some Internet forums the question regarding the vibrating engine and increased fuel consumption appears – we cannot exclude such possibility. Most typical causes – defect of the ignition coil or spark plug. Additionally, to test of Lambda probes you can perform simple fuel consumption test – drive evenly on an even road with even speed (preferably – using cruise control) and, using the indications of car’s bort computer, indications will be quite correct. This test will be even more efficient if the increased fuel consumption is typical when driving long distances. If increased fuel, instead, is typical, when driving in a city, the higher impact will be especially of idle/low load mode problems (oiling of HVA, Valvetronic). Of course, the problems with thermostat, insufficient performance of CO catalytic converters, could be the cause of the problem in any driving mode, these things have to be checked always.